"Pants suit" redirects here. For the lawsuit about a pair of pants, see Pearson v. Chung. 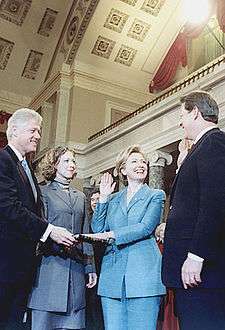 Hillary Clinton wearing a pantsuit as she is sworn in as Senator. The pantsuit was introduced in the 1920s, when a small number of women adopted a masculine style, including pantsuits, hats, canes and monocles. However, the term, "trouser suit" had been used in Britain during the First World War, with reference to women working in heavy industry. During the 1960s trouser suits for women became increasingly widespread. Designers such as Foale and Tuffin in London and Luba Marks in the United States were early promoters of trouser suits. In 1966 Yves Saint-Laurent introduced his Le Smoking, an evening pantsuit for women that mimicked a man's tuxedo. Whilst Saint-Laurent is often credited with introducing trouser suits, it was noted in 1968 that some of his pantsuits were very similar to designs that had already been offered by Luba Marks, and the London designer Ossie Clark had offered a trouser suit for women in 1964 that predated Saint Laurent's 'Le Smoking' design by two years. In Britain a social watershed was crossed in 1967 when Lady Chichester, wife of the navigator Sir Francis Chichester, wore a trouser suit when her husband was publicly knighted by Queen Elizabeth II. Hillary Clinton, who is well known for wearing pantsuits, once referred to her presidential campaign staff as "The Sisterhood of the Traveling Pantsuits" (in her August 26, 2008 speech at the Democratic National Convention), a play on The Sisterhood of the Traveling Pants. During the 2016 Presidential election, the pantsuit became a symbolic rallying cry among supporters of Hillary Clinton, many of whom donned pantsuits when they went to the polls to cast their ballots. This was in part due to the influence of a facebook group of over 2 million Hillary supporters called Pantsuit Nation. ↑ "Marion Foale & Sally Tuffin". V&A. Retrieved 15 July 2014. ↑ Sheppard, Eugenia (12 September 1966). "Ballerina is Heroine of Medium Price Coat". The Daily Times-News, Burlington. Retrieved 20 March 2015 – via Newspapers.com. ↑ Alexander, Hilary. "Smoke Without Fire." The Telegraph (Dec. 12, 2005). ↑ Milinaire, Caterine (30 September 1968). "Let the Winners Lead the Way". New York Magazine: 27–29. Retrieved 20 March 2015. ↑ Watt, Judith (2003). Ossie Clark, 1965-74. London: V&A Publications. ISBN 9781851774074. 1 2 Robin Givhan - The Washington Post (2004-01-21). "Moseley Braun: Lady in red - tribunedigital-chicagotribune". Articles.chicagotribune.com. Retrieved 2016-11-10. ↑ AUG. 26, 2008 (2008-08-26). "Hillary Rodham Clinton's Democratic Convention Speech - The New York Times". Nytimes.com. Retrieved 2016-11-07.